Summer Holcombe was born circa 1832.1 Summer Holcombe was the child of Hermaz Holcombe II and Emily Latham. Joseph Stanton Holcombe was born on 29 April 1839 at Windsor, Hartford Co., CT.1,2 He was the son of Hermaz Holcombe II and Emily Latham. Joseph Stanton Holcombe married Orrell Ruby Bowers in 1861. 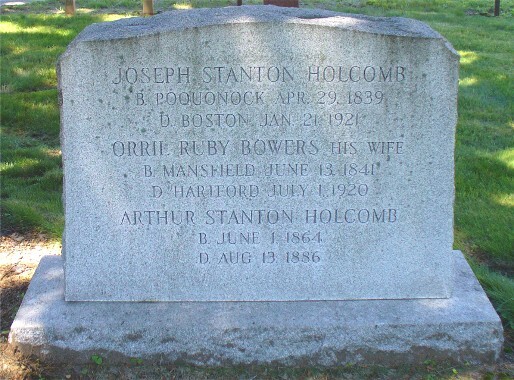 Joseph Stanton Holcombe died on 21 January 1921 at Boston, Suffolk Co., MA, at age 81. He was buried at Elm Grove Cemetery, Windsor, Hartford Co., CT.
Joseph and Ruby A. were enumerated in the 1880 Windsor, Hartford Co., CT, federal census. He was an explorer and surveyor, age 41; she was 38. Children in the household were Arthur 16, and Josephine H. 12. Joseph and Ruby were eumerated in the 1900 Windsor, Hartford Co., CT, federal census. He was a farm laborer, age 61; she was 58. There were no children in the household. Joseph S. and Ruby O. were enumerated in the 1910 Windsor, Hartford Co., CT, federal census. He was a laborer, age 70, she was 68. One of their 2 children was still living. [S25] Hannah McPherson, Holcombe Genealogy, Page 100.2/Item A-6-7-5-9-3-6. Ellen M. Holcombe was born in November 1849 at CT. She was the daughter of Hermaz Holcombe II and Emily Latham. Ellen M. Holcombe married Thomas Clark say 1874. Ellen is recorded in the 1900 Windsor census, page 14B, with husband Thomas Clark, and mother Emily, then aged 92. Orrell Ruby Bowers was born in June 1841 at CT.1 She married Joseph Stanton Holcombe, son of Hermaz Holcombe II and Emily Latham, in 1861. Helen Josephine Holcombe was born in 1867. She was the daughter of Joseph Stanton Holcombe and Orrell Ruby Bowers. Arthur Holcomb Harris was born on 7 April 1889 at Middletown, Middlesex Co., CT. He was the son of Edwin Hazen Harris and Helen Josephine Holcombe. Arthur Holcomb Harris died in 1964. Arthur was a dealer in road builders supplies, member of the American Road Builders Association and of the American Society of State Highway Officials. [S25] Hannah McPherson, Holcombe Genealogy, Page 100.2/Item A-6-7-5-9-3-5-4-1. Raymond Hazen Harris was the son of Edwin Hazen Harris and Helen Josephine Holcombe. Robert Edwin Harris was born on 4 October 1921 at New Britain, CT. He was the son of Arthur Holcomb Harris and Elizabeth Frances Dillon. Richard Dillon Harris was born on 8 November 1925 at New Britain, CT. He was the son of Arthur Holcomb Harris and Elizabeth Frances Dillon. Mrs. Hortense Holcomb, 76 years old, wife of Theron M. Holcomb, died Monday at the Hartford Hospital, after a long illness. She lived at No. 100 Preston street. She leaves her husband, in this city, and two grandchildren, Elliott S. Holcomb and Robert N. Holcomb of Springfield, Mass. Funeral services will be held at 2:30 o’clock this afternoon at the Elm Grove Chapel, Elm Grove Cemetery, Poquonock. [S284] Courant, 10 October 1917. Leon Clark Holcombe lived at Longmeadow, Hampden Co., MA. He was born in March 1877 at CT. He was the son of Theron N. Holcombe and Hortense G. Clark. Leon Clark Holcombe married Grace V. Nichols on 8 January 1900. Asst. in Dept of Taxidermy, Harvard Coll. Grace V. Nichols was born in February 1879 at MA.1 She married Leon Clark Holcombe, son of Theron N. Holcombe and Hortense G. Clark, on 8 January 1900. Letitia Johnson Dow was born on 16 September 1806 at Dublin, Ireland. She was the daughter of Lorenzo Dow and Margaret Holcombe. Letitia Johnson Dow died young at Warrington, Ireland. May Hall was the daughter of Nathaniel Hall and Belinda Holcombe. [S25] Hannah McPherson, Holcombe Genealogy, Page 111.1/Item A-8-1-1-8-5-1. Pamelia Hall was the daughter of Nathaniel Hall and Belinda Holcombe. Daughter Hall was the daughter of Nathaniel Hall and Belinda Holcombe. John Wheeler Hall was the son of Nathaniel Hall and Belinda Holcombe. [S25] Hannah McPherson, Holcombe Genealogy, Page 111.1/Item A-8-1-1-8-5-4. Daniel Hall was the son of Nathaniel Hall and Belinda Holcombe. Daniel drowned in Lake Camplain, NY. His descendants lived in Buffalo, NY. [S25] Hannah McPherson, Holcombe Genealogy, Page 111.1/Item A-8-1-1-8-5-6. John Huntington was the son of Christopher Huntington and Ruth Rockwell. Christopher Huntington was the son of Simon Huntington and Margaret Barrett. Christopher Huntington married Ruth Rockwell, daughter of William Rockwell and Susanna Capen, on 7 October 1652. Ruth Rockwell was born in August 1633 at Dorchester, Suffolk Co., MA. She was the daughter of William Rockwell and Susanna Capen. Ruth Rockwell married Christopher Huntington, son of Simon Huntington and Margaret Barrett, on 7 October 1652. [S246] Henry Ensign Rockwell, Rockwell, Page 44. [S52] Henry R. Stiles History of Ancient Windsor II, Page 647. [S264] Ross Robert Rockwell, Rockwell Families, Page 16. [S52] Henry R. Stiles History of Ancient Windsor II, Page 648. Mary Capen was the daughter of Joseph Capen and Priscilla Appleton. Mary Capen married Thomas Baker Jr.
Child of Mary Capen and Thomas Baker Jr.
Thomas Baker Jr. married Mary Capen, daughter of Joseph Capen and Priscilla Appleton. Priscilla Baker was the daughter of Thomas Baker Jr. and Mary Capen. Priscilla Baker married Tarrant Putnam Jr.
Child of Priscilla Baker and Tarrant Putnam Jr.
Tarrant Putnam Jr. married Priscilla Baker, daughter of Thomas Baker Jr. and Mary Capen. Priscilla Putnam was the daughter of Tarrant Putnam Jr. and Priscilla Baker. Priscilla Putnam married Adam Brown Jr.
Child of Priscilla Putnam and Adam Brown Jr.
Adam Brown Jr. married Priscilla Putnam, daughter of Tarrant Putnam Jr. and Priscilla Baker. Israel Putnam Brown was the son of Adam Brown Jr. and Priscilla Putnam. Israel Putnam Brown married Sally Briggs. Sally Briggs married Israel Putnam Brown, son of Adam Brown Jr. and Priscilla Putnam. Sally Brown was the daughter of Israel Putnam Brown and Sally Briggs. Sally Brown married Israel C. Brewer. Israel C. Brewer married Sally Brown, daughter of Israel Putnam Brown and Sally Briggs.